Below is our seasonal home maintenance schedule. It is divided into the four seasons, with some tasks performed monthly, quarterly, bi-annually, or just once a year. The hope is that between the weekly cleaning schedule and the seasonal home maintenance schedule, our house will be well maintained throughout the year without having to play catchup in the spring and fall. If you live outside of the south or in an area that receives exceptionally cold or snowy weather, you may want to trade some of the fall and winter items. Living along the coast, we usually don’t experience freezing weather until November/December so we don’t have to winterize until later in the season. This is the second part of our Home Management Binder. 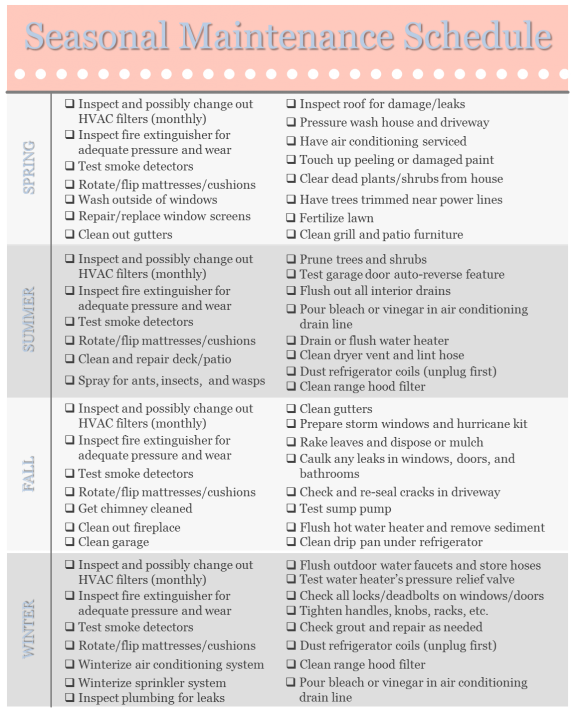 Feel free to print this out with our weekly cleaning schedule to make as your own or simply use the list as inspiration for your personal home management plan. Either way, we are here to encourage each other to keep our homes in order and avoid any mishaps through regular maintenance.